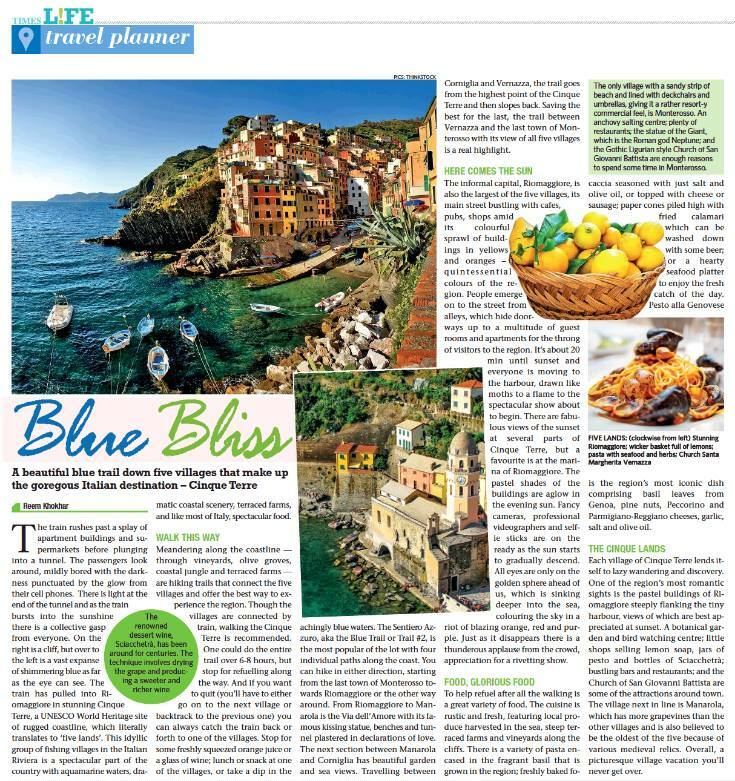 Was thrilled to have my piece on Cinque Terre published in the Jan 21, 2017 edition of the Times of India (Times Life). 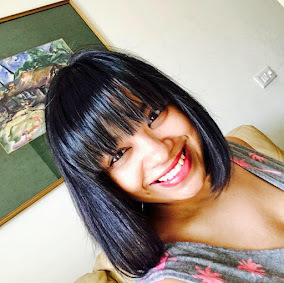 Sharing the slightly longer version in the post below. 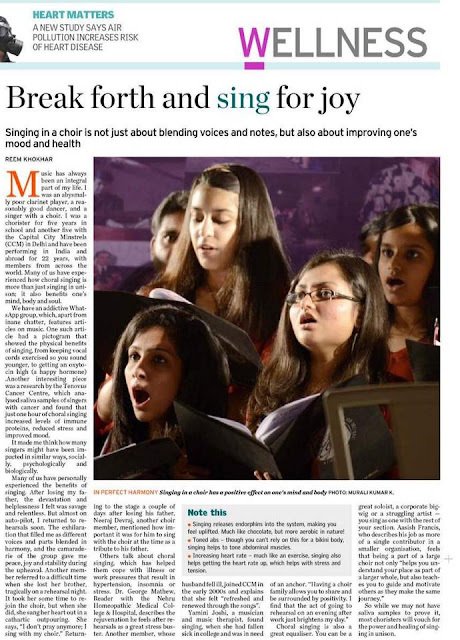 The online version of the print article is here. The train rushes past a splay of apartment buildings and supermarkets before plunging into a tunnel. The passengers look around, mildly bored with the darkness punctuated by the glow from their cellphones. There is light at the end of the tunnel and as the train bursts into the sunshine there is a collective gasp from everyone. On the right is a cliff, but over to the left is a vast expanse of shimmering blue as far as the eye can see. The train has pulled into Riomaggiore in stunning Cinque Terre, a UNESCO World Heritage site of rugged coastline, which literally translates to ‘five lands’. 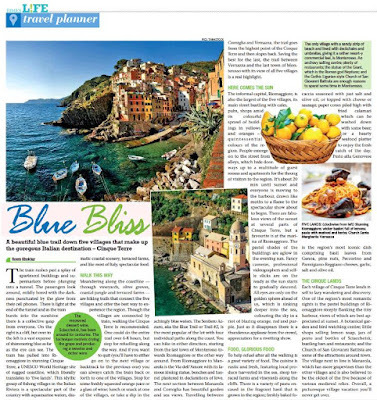 This idyllic group of fishing villages in the Italian Riviera is a spectacular part of the country with aquamarine waters, dramatic coastal scenery, terraced farms, and like most of Italy, spectacular food. A day trip is insufficient to soak in the magic of the area. There are at least five reasons for a leisurely stay in Cinque Terre. are hiking trails that connect the five villages and offer the best way to experience the region. Though the villages are connected by train, walking the Cinque Terre is recommended. One could do the entire trail over 6-8 hours, but refuelling stops along the way; giving oneself time to take in the scenery and breaking the trail up over a couple of days is worthwhile. And if you want to quit along the way (you’ll have to either go on to the next village or backtrack to the previous one) you can always catch the train back or forth to one of the villages. Stop along the way for some freshly squeezed orange juice or a glass of wine; lunch or snack at one of the villages, or take a dip in the achingly blue waters. The Sentiero Azzuro, aka the Blue Trail or Trail #2, is the most popular of the lot with four individual paths along the coast. It requires the purchase of a Cinque Terre card that gives you access to the trails and train for a specified amount of days. You can hike in either direction, starting from the last town of Monterosso towards Riomaggiore or the other way around. At times sections of the trail can be closed for maintenance or safety issues. Though not difficult, parts of the track can be fairly strenuous with hundreds of steps to ascend, steep inclines and narrow passes, but there is a good mix of uphill, downhill and flat bits to keep your heart rate confused. From Riomaggiore to Manarola is the the Via dell'Amore with its famous kissing statue, benches and tunnel plastered in declarations of love. 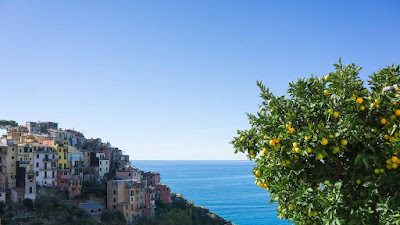 The next section between Manarola and Corniglia has beautiful garden and sea views. Continuing on between Corniglia and Vernazza, the trail goes from the highest point of the Cinque Terre and then slopes back so there is a fair amount of climbing and descending, but the beautiful olive groves and dramatic views over the water make it very worthwhile. Saving the best for last, the numerous steps and narrow passes require some stamina, but the trail between Vernazza and the last town of Monterosso with its view of all five villages is a real highlight. Other trails include the Sentiero Rosso, or Red Trail, which forms a high arc above the five villages. It’s more challenging than Azzuro, but also a rewarding trail through some spectacular scenery. cafes, pubs, shops amid its colourful sprawl of buildings, the yellows and oranges quintessential colours of the region. People emerge on to the street from alleys, which hide doorways up to a multitude of guest rooms and apartments for the throng of visitors to the region. It's about twenty minutes until sunset and everyone is moving to the harbour, drawn like moths to a flame to the spectacular show about to begin. 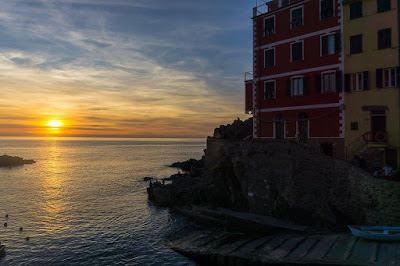 There are fabulous views of the sunset at several parts of Cinque Terre, but a favourite is at the marina of Riomaggiore. All around the harbour are silhouettes of people looking out over the sea toward the horizon. The pastel shades of the buildings are aglow in the evening sun. Fancy cameras, professional videographers and selfie sticks are on the ready as the sun starts to gradually descend. 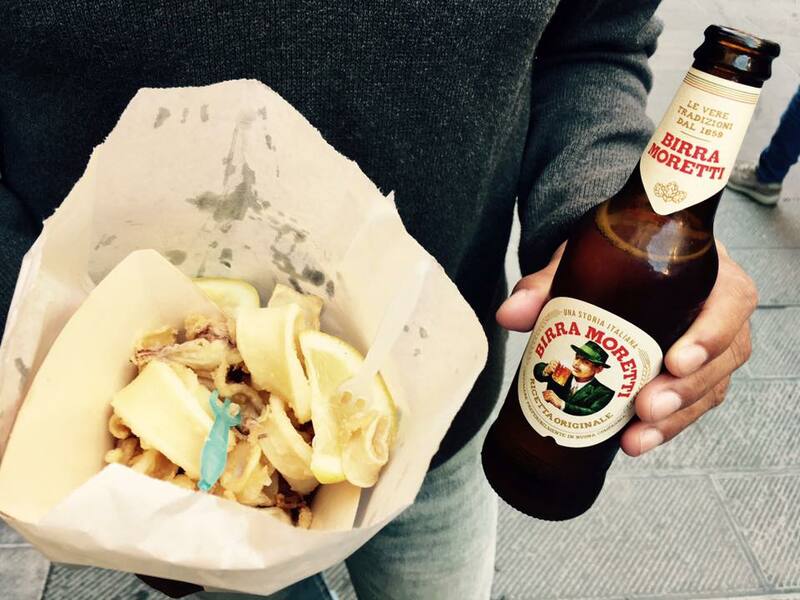 People are clutching cones of dripping gelato or sitting at a few optimally placed restaurants sipping on glasses of wine or beer. Wet suited kayakers make their way back to the harbour, rowing furiously to shore. Couples hug each other and take selfies against the golden sea, and a young girl does a perfect headstand, eliciting appreciative cheers from everyone. But soon all eyes are only on the golden sphere ahead of us, which is sinking deeper into the sea, colouring the sky in a riot of blazing orange, red and purple. Momentarily there is only a sliver left and just as it disappears there is a thunderous applause from the crowd, appreciation for a riveting show. lemon soap, jars of pesto and bottles of Sciacchetrà; bustling bars and restaurants; and the Church of San Giovanni Battista are some of the attractions around town. The village next in line is Manarola, which has more grapevines than the other villages and is also believed to be the oldest of the five because of various medieval relics. Boats on the main street, little alleyways with a jumble of colourful houses, and the Gothic style Church of San Lorenzo with a defence tower are distinct to the town. If you take the train to Corniglia, third of the five from either side, you have an uphill walk to the town, the only one that is not approachable by sea. The Scalinata Lardarina (375 steps) leads up to the quiet village atop a cliff and you can catch your breath at the lovely sea facing terrace. In contrast to the rest, Corniglia is classified as a rural village as opposed to a maritime one, surrounded on three sides by vineyards. There is also a small beach approachable by foot, an isolated rocky cove with clear waters that usually has fewer people because of its location. Vernazza is a fairly busy village with a bustling main street and a natural pier, views of which are quite gasp worthy. The picturesque central square, Piazza Marconi, is filled with pubs and restaurants; boats and fishing nets; and people sitting around for a chat and some sunshine. Taking in the views from the Belforte Tower at the Doria Castle, and a visit to the Church of Santa Margarita d'Antiochia with its 40 metre high bell tower, are a must. The only village with a sandy strip of beach and lined with deckchairs and umbrellas, giving it a rather resort-y commercial feel, is Monterosso. Divided into two parts and connected by tunnel, there is the newer Fegina side with the train station and main beaches and Monterosso Vecchio, the historical side. An anchovy salting centre; plenty of restaurants; the statue of the Giant, which is the Roman god Neptune; and the Gothic Ligurian style Church of San Giovanni Battista are enough reasons to spend some time in Monterosso. with terraced vineyards and spectacular views the walk up now is far from punishing and one can also take an electric shuttle bus if the climb is too daunting. Riomaggiore’s Our Lady of Montenero originated in 1335 and has had several restorations over time. It was built to protect an image of the Madonna, which had been hidden underground by the locals for years to protect it from raiders. Legend has it that when excavated, a fountain spurted from that very spot. There are sweeping views from the top over the Ligurian coastline and the possibility of spotting Corsica if the sky is clear. Manarolo’s sancturary is the lovely Romanesque church – Sanctuary of Our Lady of Health. Distinct features include a gothic double lancet window in the sandstone arch at the entrance and a barrel vault in the church’s interior. In the village of San Bernadino, close to Corniglia, is the Sanctuary of our Lady of Grace. It came into existence due to the 19th century restoration of a medieval chapel that originated at the site. Founded by St Bernard of Sienna, the distinct feature in this church is a painting of the Madonna with Child in between a picture of St. Bernard of Chiaravalle and St. Bernard of Siena. 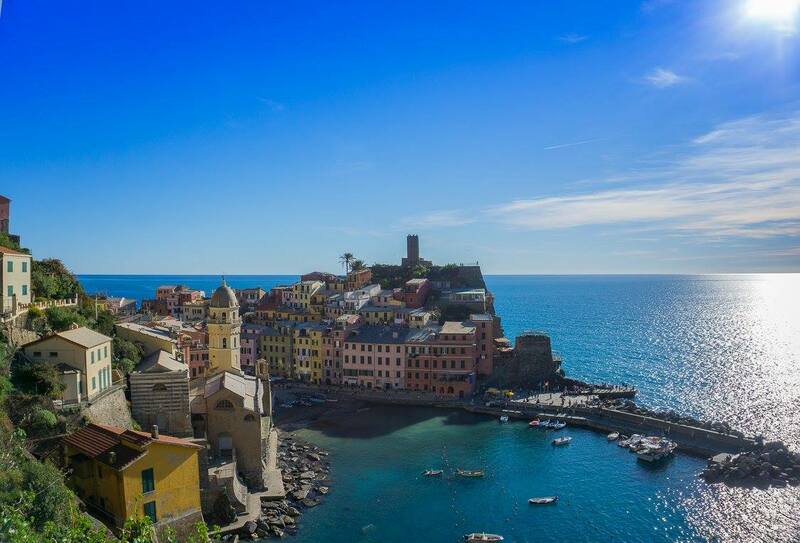 Vernazza’s Sanctuary of our Lady of Regio has only the façade remaining of the structure that was built over a crypt. Famous for its Black/African Madonna that was supposedly brought over by Crusaders, a festival dedicated to this Madonna is held on the first Sunday in August. 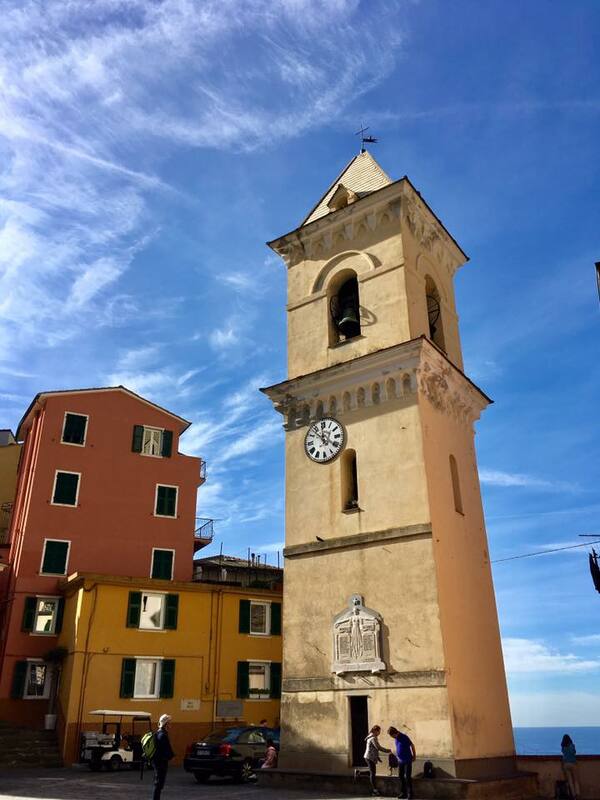 The oldest shrine dedicated to the Virgin Mary in the Ligurian region is the Sanctuary of Our Soviore in Monterosso and the structure is a mix of Baroque, Gothic and Romanesque styles reflecting the various renovations over time. A wooden Pietá is within the church and the sanctuary is celebrated through a festival on August 15 each year. Everybody love the music in northern countries they have orchestra which all are sing together. This was a quiet moment for me in top canadian writers when I saw this first time they all are looking too cute to sing on just one beat.